In 1983, my son Peter was the very first person living with AIDS in Canada to speak openly about his story. Peter spoke to anyone who would listen. He called up the media and used those interviews to educate people about the reality of AIDS. I am so proud of what he accomplished, and I’m proud to share his story with you. 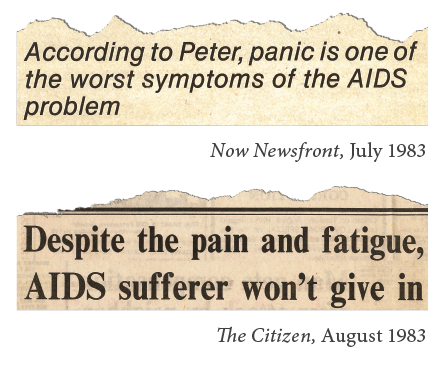 Peter was one of the earliest Canadians to be diagnosed with AIDS. He was the only spokesperson with the disease, at a time when doctors and society were just beginning to understand what was going on. Peter found out he was sick when he was working as a costume designer in Europe. He came back right away so we could take care of him at home in Ottawa. We made sure his boyfriend could come to Canada several times to see him before he passed away, as we knew the diagnosis was terminal. Yet, still we wanted Peter’s illness to be like any other illness, except it really wasn’t. At the time, no one wanted to talk about AIDS. In Canada, Peter educated others about what it was like to have AIDS. Peter was a proud man, and he needed to speak out. Peter went all over the country to raise money for research and to educate people about AIDS. While more than 30 years have passed, talking about HIV and AIDS is still a challenge for many. We held the first AIDS Awareness Walk-a-thon in Ottawa on October 1, 1983. It was the last year Peter was able to walk around, and he led the march. I was so proud; it was a hopeful moment that I could remember during all of the pain that was about to come. I’ve been keeping my son’s memory alive and continuing his legacy since he passed away in 1984. I’m asking you to help me to keep his legacy alive by funding HIV and AIDS research and awareness through a donation to the Canadian Foundation for AIDS Research (CANFAR). I remember that next year, when Peter wasn’t at the AIDS Walk. I made about twelve dozen muffins and about thirty people showed up at Ottawa City Hall. It felt like there was a little more hope in the air that year: because of research, the medications were coming out, and treatment was getting better. I keep up to date on research and the facts about HIV and AIDS. I continue to receive CANFAR’s materials, and I feel so hopeful when I read the stories about people living at their best with HIV. I’ve been told about the generous CANFAR donors who will match your donation twice over by December 31, 2017. I’ve also heard that there’s still a new HIV infection every three hours in Canada. 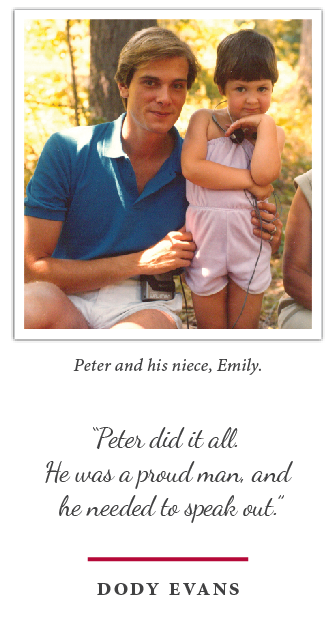 This is a serious issue, and we need to further Peter’s legacy of awareness, and raise much-needed funds for research. This campaign is a loving tribute to my son, and the work he did. I ask that you please take a moment to donate in Peter’s memory, and continue CANFAR’s mission to fund research and awareness. Thank you for reading Peter’s story, and for your support. P.S. They tell me if I draft a short note here to remind you to donate; that you might give a bit more. That has me laughing a little, and therefore I am asking you one last time to donate what you can. Some years I’ve been able to give less, some more… but I always know CANFAR places the funds in the best hands. But do it right away, or you might forget. Together, we can keep Peter’s legacy alive by funding HIV and AIDS research and awareness through a donation to the Canadian Foundation for AIDS Research (CANFAR). Donate today to support Peter Evans’ legacy and help ensure that CANFAR can meet all its ambitious research commitments in the year ahead. We are getting closer to finding a cure for HIV, and your donation will help in this noble pursuit.